Welcome to another types of carriers post! Today I will be talking about slings. To learn about other types of carrier follow the links in this post. 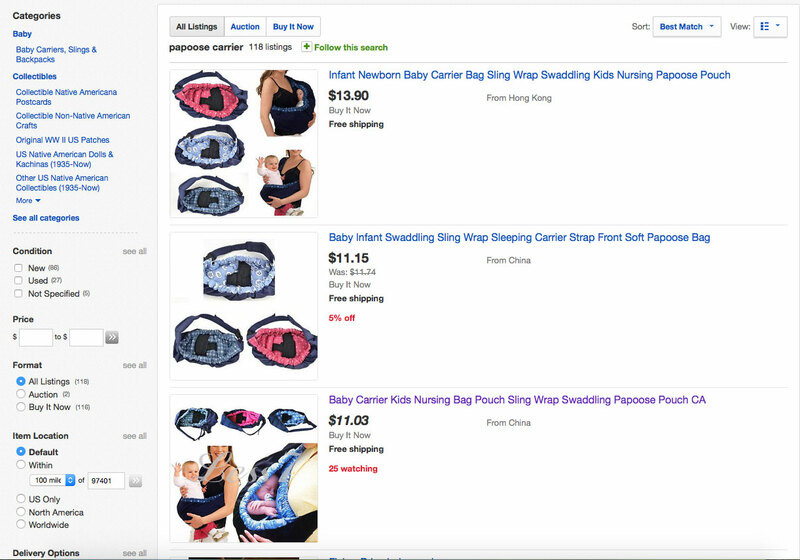 Ring slings and pouch slings are the two types of slings (I will also talk about the recalled bag slings because they also fit in here and only one brand was recalled so they are still floating around and are unsafe). Ring slings are very adjustable and can be great from birth through short bursts in toddlerhood depending on the material. Ring slings are available in cottons or can be converted from a woven wrap for extra durability and support. 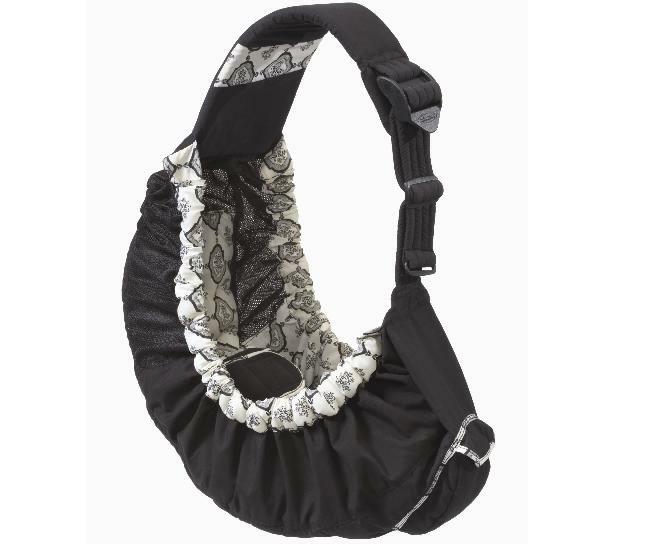 Pouch slings can come in adjustable sizes but are not supportive enough of a newborn’s spine so they are better suited for babies that can sit on their own for short periods of time. They are great for toddlers who want to be up and down a lot. Ring slings are very adjustable. They are a great carrier to have if you want to have just one carrier that will fit mom, dad, grandma, grandpa, aunties, uncles, and anyone else who would like to wear baby. They are great twin carriers because you can wear two pretty easily at the same time, but you can also have one carrier for each parent to wear one baby as well. 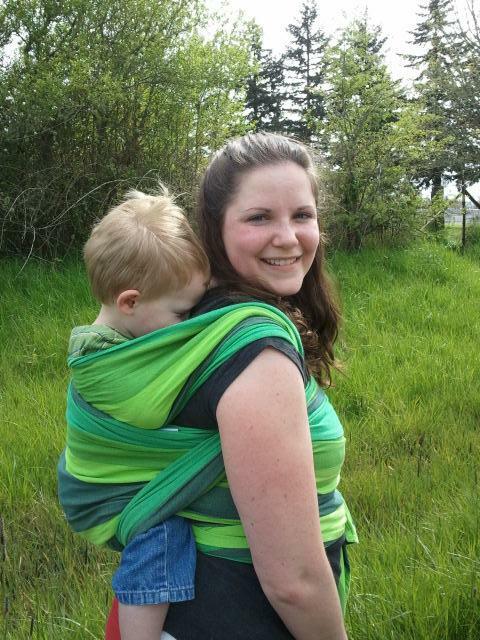 Ring slings are pretty easy in and out so they can be great for short bursts with a toddler. 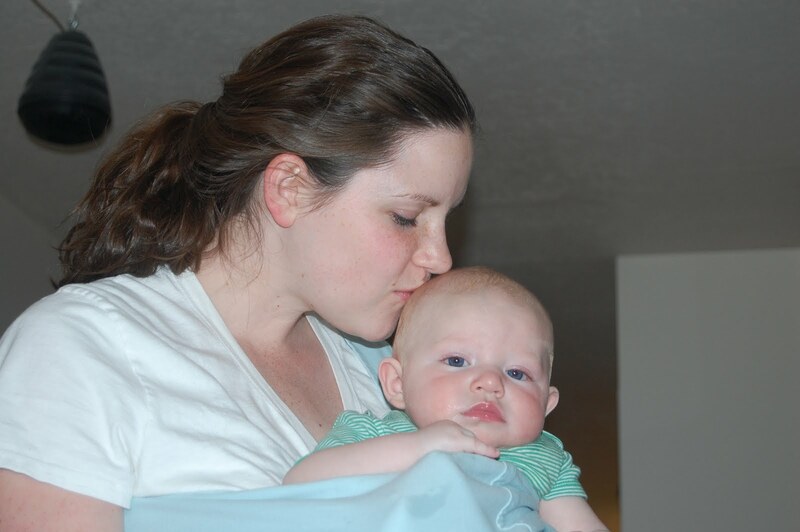 Many moms find ring slings easy to breastfeed in so they are great for breastfeeding. Because they are so adjustable and supportive they are great for newborns. They come in a variety of materials. Cotton is the most popular. They can be converted from a woven wrap which makes an even greater variety of options. 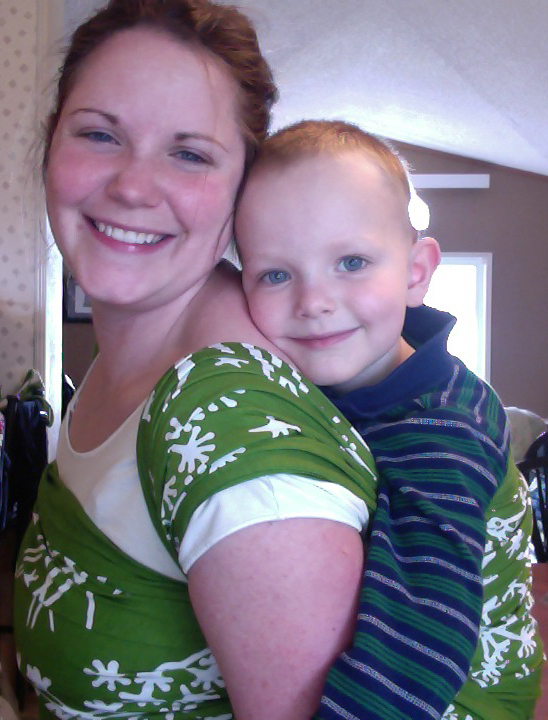 Many parents find that wrap convert ring slings are more supportive for toddlers. Ring slings can be made by someone with minimal sewing skills but fabric choices are important and it’s extremely important to be sure to use Sling Rings brand rings because there are no welds (which can wear on the fabric) and are made of aluminum (or a nylon for water slings) specifically for ring slings. It is not safe to use craft rings because they are not specifically designed for ring slings and may not hold up to the pressure that is on them. Craft rings would be fine for a child carrier for a child to “wear” their baby doll or stuffed animals in. 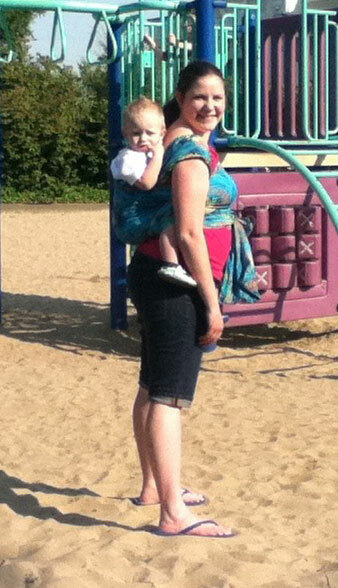 Ring slings can be worn on the front or hip. A back carry is an advanced carry but can also be done with much practice on the front before attempting a back carry. It’s important to note that many health care providers do recommend switching up the shoulder so that you don’t end up putting pressure and using more muscles in one side of your body. 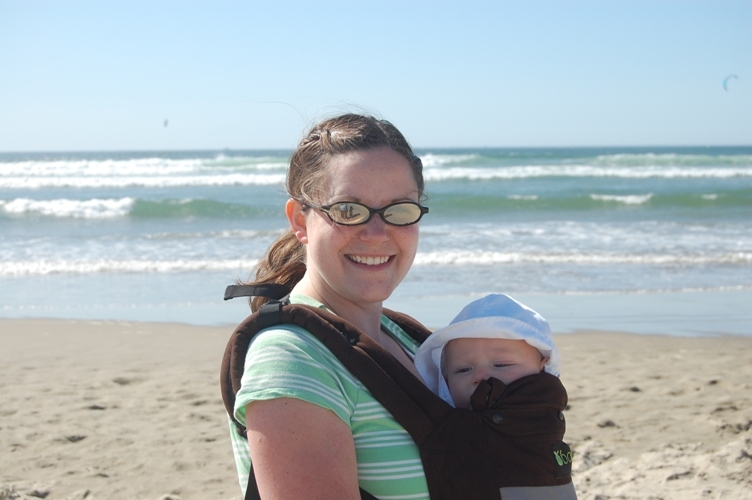 Pouch slings used to be recommended as the go-to for newborns back around 2008 when my first son was born. Some are adjustable, many are not. It’s imperative that you pick the right size. As with all carriers, baby’s bottom should hit at or above mom’s belly button when baby is sitting in the fabric (this promotes good ergonomics for parents and is especially important for mother’s pelvic floor muscles). The shoulder can be flipped out to help bring baby in closer but pouch slings just are not supportive enough for newborns. Pouch slings (that fit well) can be great carriers for older infants that are able to sit on their own and are great for living in the car or diaper bag, especially if you have forgotten your carrier and need one to go in the store or to keep baby off of the floor to wash your hands after a diaper change. Some popular brands have “free” codes very often but charge quite a bit for shipping and the fabric is not very good quality. They may be good in a pinch but I wouldn’t recommend them as anything but an emergency carrier. Other brands use high quality fabrics and make great pouch sling carriers. With the right fabrics and lots of sewing experience these can be made at home but need specialized seaming experience to make the carrier safely. *When you learn better, you do better* Kangaroo in a pouch sling as a newborn in the cradle carry. He’s upright so his airway is not compromised but I do not recommend this position or this carrier for a tiny baby knowing more about baby’s anatomy and development. My boys always hated this so it never lasted for more than a few minutes-babies are smart and know what they need. Infantino made a bag sling that was later recalled. 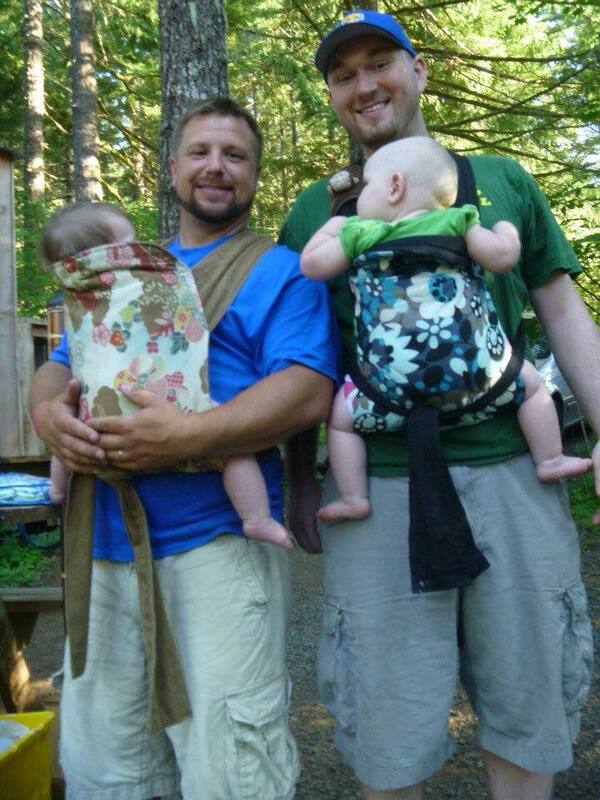 Three babies were killed in these slings which some in the babywearing community have nicknamed “the bags of death.” I think this name is a little extreme. I refer to them as bag slings. They resemble a duffle bag and instructions showed the baby being worn very low usually which goes contrary to mother’s instincts (and isn’t great for ergonomics for our bodies). With baby so far removed, the parents couldn’t sense that baby’s airway had been compromised and baby stopped breathing. This can happen in other carriers so it is best practice to keep your baby upright and facing parent, tight and close enough to just nod your head down to kiss the top of your baby’s head. When your baby is up high you are better able to feel baby’s chest and stomach move while they are breathing. I bring these carriers up because Infantino was the only brand that recalled their slings. Other brands still make similar carriers and these can still be found and some resale shops being sold by store owners unaware of the recall. If you ever catch one of these at a shop or a garage sale be sure to let the person know. These carriers can be traded in to Infantino for a safe and ergonomic carrier. Please check with Infantino for more details (as of this posting they would trade for a mei tai carrier). If you see a mother using a carrier like this do pass along your local baby wearing group’s information or my information and I would be happy to send information as well as information to find a good quality and safe carrier for any budget. Very very few carriers are considered dangerous-these are on the short list that no parent should ever use. Knock offs are still widely available. In this screen shot (taken September 10, 2015) you can see many bag slings. Note the picture that you can see baby’s face. 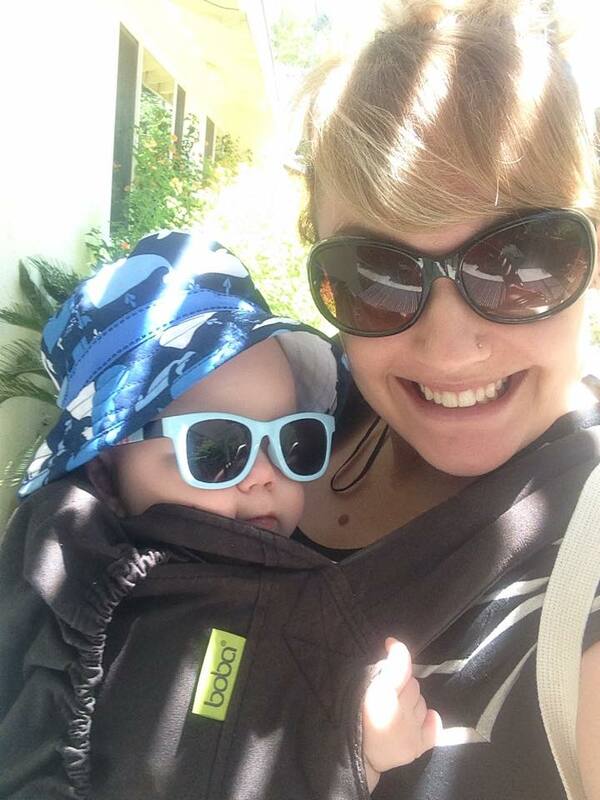 Baby’s chin is to its chest-this is near impossible to avoid in these bag-style sling carriers. Baby is also not in view or is hard to see. 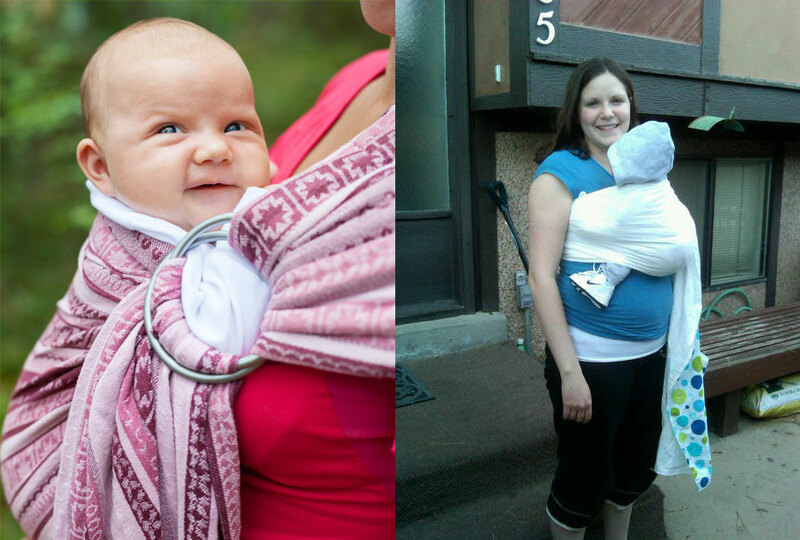 What ages and stages or activities do you like to use ring slings for? Welcome to the Types of Carriers series! Be sure to check out the Types of Carriers post from a couple of weeks ago to learn about all of the classes of carriers. Included in this type of carrier are stretchy wraps, gauze wraps, hybrid wraps, and woven wraps. Each are a simple piece of cloth made out of natural fibers (including cotton, linen, sometimes wool) or in the case of stretchy wraps and hybrid cotton blended with Lycra to give it the stretch characteristic of the type of wrap. Organic Sleepy Wrap (now Boba Wrap). Sorry for the darker image but I really wanted to share this one. 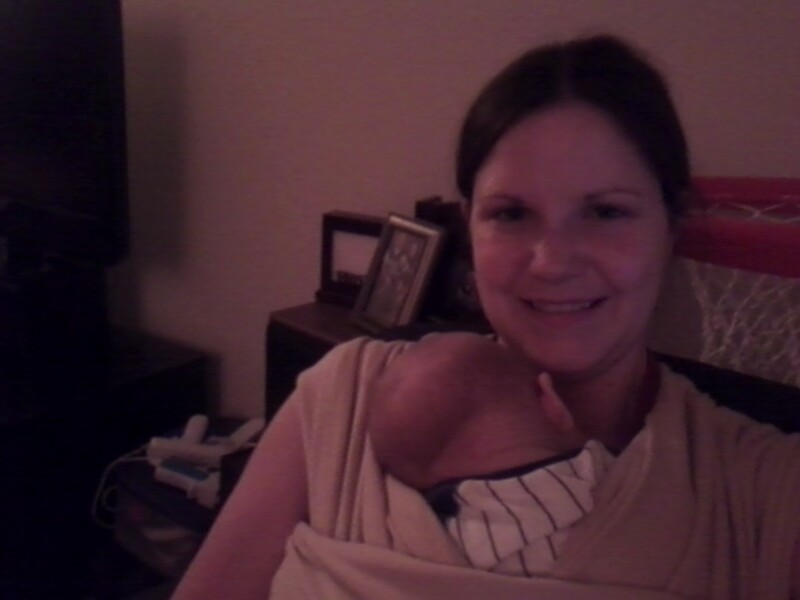 This is me wearing my second son when he was just a few weeks old in my Organic Sleepy Wrap (now Boba Wrap). Stretchy wraps are blended with Lycra and are very stretchy. Stretch does vary a bit by brand. The most popular brands of stretchy wraps are Moby and Boba. They offer a lot of colors and even prints. They are cuddly for newborns but must be wrapped tightly without leaving room to put your baby in. You have to prewrap before putting your baby in so you have to put baby down in a safe place to wrap. You can prewrap before going out for the day though and pop baby in when you get to your destination. These wraps are limited to wearing on your front and possibly to your hip. They do not support the spread squat positioning well past about 10-15 lbs depending on the baby. They are a great way to try out babywearing though! You can DIY (make your own) with good quality fabric, though often these are VERY stretchy. These may be a little warmer in the summer (feel much like a blanket) but many parents still enjoy these carriers in the summer. Gauze wraps are very lightweight and nice for summer. They are made of a lightweight cotton. Because they are lightweight though, many parents and caregivers find that even if they wrap very carefully they are quite pinchy on the shoulders once your baby/toddler hits about 20-25 lbs. These are great for front, back, or hip carries though. They wrap differently than wovens so you may have to order a slightly different size in a gauze wrap than you do with a woven. I am typically a 4.6 m (size 6) for my base size in a woven wrap but I need extra length in a gauze wrap to do carries that use most of the wrap like the double hammock wrap as shown above. You can DIY with the right materials but the materials are outside of the scope of this post. Hybrid wraps feature one way stretch rather than two way stretch. There are a few different brands available of these. The picture below shows me wrapping my oldest when he was 5 for a quick minute. They are best for babies under 20-25 lbs because over that weight the wrap will start to sag even if you wrap very carefully so you may need to adjyst it often. These are excellent for newborns. One con though is that the material is similar to that of many stretchy t-shirts so when back wrapping it may be hard to feel the fabric. Woven wraps are the gold standard of SPOC. They are a bit more expensive at first but you can typically find a good used one for around $100 or less. They have a little bit of a learning curve so I recommend getting hand on help because once you know how they are supposed to feel you will always get it right. Woven wraps can be wrapped an infinite number of ways. They can be worn with baby on your front, back, or hip. They are the most supportive of the classes of wrap carriers and are excellent from birth to as long as you want to wear your child. There are many lengths available because wrapping with just one layer over baby is fine (and supportive). I recommend starting with your “base” size which is what you can comfortably wrap a Front Wrap Cross Carry (FWCC) with. Shorter lengths (just doing one layer over baby) can be great in the summer depending on the fabric. There are many different blends of fabrics available. I recommend starting with a cotton one or a cotton/linen blend. Cotton is the easiest to care for and can be dried in the drier (though it may shrink a little so hang drying is better-try putting it between the backs of two chairs and often it will dry overnight). Woven wraps can be found at all types of price points. There are many brands of good quality wraps available. There are many color options and many options for patterns, stripes, or just a plain color. Many can be dyed if you don’t like the color (you will want to use baby-safe dyes because baby WILL chew on the wrap). I recommend new wrappers to look in to getting a used wrap because new wraps in all fabrics usually feel stiff. Wraps need a breaking in period to be able to wrap well with them. If you buy used, many times this wrap is already broken in but has a lot of life left in it. New wrappers can break in wraps but do know that it may take time before you can wrap the same way you did with your Certified Babywearing Educator (or at your babywearing group). Natibaby 4.6 wrap, 100% cotton, double hammock carry. A Kanga Carrier is a Traditional African carrier using a thin blanket looking piece of fabric. Baby is worn on the back in the small of mother’s back. If you would like to see one in action I really love this video by Alyssa. These are beautiful traditional carriers. I do have one in my stash but I am not nearly as well versed with these as women that traditionally use them. What is your favorite type of wrap? Today I’m going to talk about types of carriers a little bit. I’m going to go more in depth in to the pros and cons of each type of carrier in coming weeks but I want to touch a little on each and share some pictures of each. Among these are stretchy wraps, gauze wraps, hybrid wraps, and woven wraps. Each are a simple piece of cloth made out of natural fibers (including cotton, linen, sometimes wool) or in the case of stretchy wraps and hybrid cotton blended with Lycra to give it the stretch characteristic of the type of wrap. Woven wraps are the most versatile and the only carrier that will fit baby properly from birth to as long as you want to wear. They do have a bit of a learning curve but are wonderfully comfortable once you get some hands on help and know how it’s supposed to feel. Stretchy Wrap: Best for newborns, doesn’t really support spread squat positioning well past about 10-15 lbs, may be a little warm in the summer because they are thicker, made of cotton/Lycra blended. Can DIY with a good quality of fabric. Gauze Wraps: Great up to about 20-25 lbs, nice and breezy for summer. Made of lightweight cottons. Can DIY with the right materials. Hybrid Wraps: Because of 1 way stretch they are ok for back carries if you have some solid experience and a foundation in wrapping, more supportive for a newborn, not as comfortable once your baby is about 20-25 lbs because you need to frequently adjust it. Woven Wraps: A bit more expensive at first but you can typically find a good used one for around $100 or less, a bit of a learning curve, most supportive wrap carrier, excellent from birth to as long as you want to wear, infinant ways to carry on front, hip, or back, one layer of fabric in carries is just fine so many different lengths available, can be great in summer depending on fabric, many different blends available, available at all types of price points, many brands, many options for colors, many options for patterns or stripes or plain. Kanga Carrier (not pictured): Traditional African carrier using a thin blanket looking piece of fabric. Baby is worn on the back in the small of mother’s back. Ring slings and pouch slings are the two types of slings. Ring slings are very adjustable and can be great from birth through short bursts in toddlerhood depending on the material. Ring slings are available in cottons or can be converted from a woven wrap for extra durability and support. Pouch slings can come in adjustable sizes but are not supportive enough of a newborn’s spine so they are better suited for babies that can sit on their own for short periods of time. They are great for toddlers who want to be up and down a lot. Ring Sling: Very adjustable, great for newborns and can be great for short bursts with a toddler, many options for fabrics, can DIY, be sure that the rings are from Sling Rings (not craft rings or any with any type of weld). Pouch Sling: Can be adjustable, usually not. Better for toddlers, not supportive enough for newborns. Mei Tais (pronounced may tie): Features 4 straps, shoulder and waist. Very adjustable and great for differing parent body types. Can be converted from a woven wrap for extra comfort. Possibly the lowest learning curve next to a soft structure carrier. Can DIY with the right pattern and materials. Soft Structure Carriers: Many brand options. Features buckling waist and structured arms that adjust or adjust and unbuckle. Most are front and back only but hip carries may be an option if the shoulder straps unbuckle. There’s also a chest clip which helps keep the shoulder straps together. Brands differ slightly in the body shape, length of padding in the shoulders, materials used (some feature a mesh panel against baby’s back), amount of padding in shoulders, etc. May have to try several brands to find what works well for your body type. Quick to get on and off. Probably the lowest learning curve. Possibly can DIY with the right materials but much more difficult to get the right buckles. Other Asian Inspired Carriers (not pictured): Onbuhimu, and Podagei (often abbreviated to Pod). Onbuhimu features rings instead of a waist strap which may be very comfortable for a pregnant mom’s growing belly but puts all of baby’s weight on your shoulders. Podagei features long top straps and a blanket-like panel. The long straps are used to cross under baby’s bottom. All of baby’s weight is on your shoulders. Can possibly DIY with the right materials and patterns. What is your favorite type of carrier?